Randy West, pictured with his wife Audrey, recently made his 100th lifetime blood donation. DAYTON — Vandalia’s Randy and Audrey West have been donating together so long that when Randy credits his wife for inspiring him to become a blood donor, Aubrey’s reaction is she can’t honestly remember. 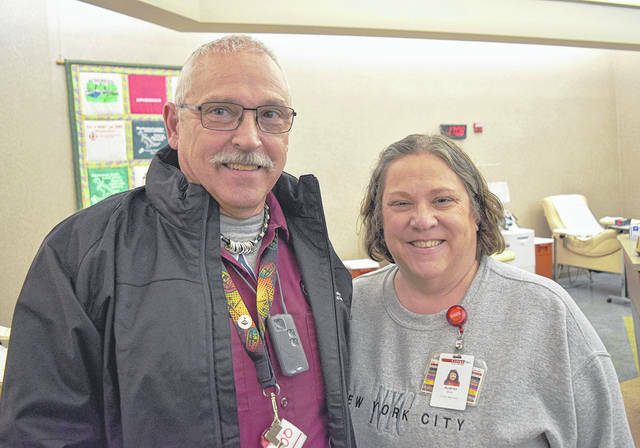 For the record, they were back at the Dayton Community Blood Center donating together again on Nov. 19 as Randy reached his milestone 100th lifetime donation. Randy and Aubrey raised two children and have two grandchildren. Randy retired after 30 years as head custodian for the Vandalia School District and now works for CompuNet. Randy’s blood type is A positive, making him an ideal platelet and plasma donor. Aubrey may have been his inspiration for becoming a blood donor, but his switch to apheresis helped him zoom ahead in lifetime donations. Randy made 13 donations in 2016, the year he began donating platelets and plasma. He made 23 donations in 2017 and reached his 100th donation with his 24th donation of 2018, the maximum number of platelet donations allowed in one year.